There’s a hot new mainstream comic strip on the market about a zany, quirky woman with a physical disability. EVERYTHING ABOUT THE starring character, “Jewel,” is fresh. She sashays about with a pretty pink elbow crutch. She’s a talented author, yet her common sense is out of whack. She regards her disability as a perk. Wanna know a secret? This comic strip happens to be based on reality. Yes, Jewel actually exists! So, does every character in this reality series comic. In order to protect identities, characters are simply addressed by their relation to the actual author. Conclusion: Move over able-bodied folks! 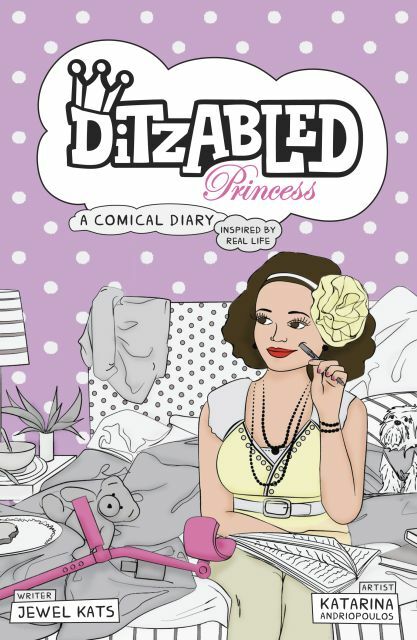 “DitzAbled Princess” is here to fill a funny page void, and give you a laugh to boot. After all, Jewel is politically correct. She's a fun-loving, demanding Diva who loves to shop as much she loves to write. Jewel is the apple of everyone's eye--be it her doting family, her doctor for her never-ending bowel issues, her pushy book editor and especially her frugal husband's soft spot. So, what's Jewel 's weakness? Her pet dogs: Snowie and Dolly. Particularly, naughty Snowie who is known to pee wherever he fancies--including Dolly's face! For Jewel, her physical disability doesn't dampen her spirits. Rather, it enhances them. She gets to use an unusual fashion accessory (Imagine: A hot pink elbow crutch.) She gets out of doing housework. She gets carried up-and-down stairs like a Princess a la command. Jewel may be horribly messy, terrible with numbers and a workaholic, but nobody can imagine life without her. Not that she would let them, anyway! She has a big mouth, remember?